SINGAPORE - Prime Minister Lee Hsien Loong has condemned the Jakarta attacks, adding that Singapore will give its full support to the Indonesian government to bring the perpetrators to justice. Singapore has also stepped up security measures in the wake of the blasts on Thursday (Jan 14) morning. "Shocked and dismayed by news of the bomb attacks in Jakarta today. Our Ministry of Foreign Affairs is contacting Singaporeans registered with our Embassy in Jakarta," Mr Lee wrote in a Facebook post. "Singapore condemns these attacks. We will give our full support to the Indonesian government to bring the perpetrators to justice. My thoughts are with the families of the victims and the Indonesian people," he added. 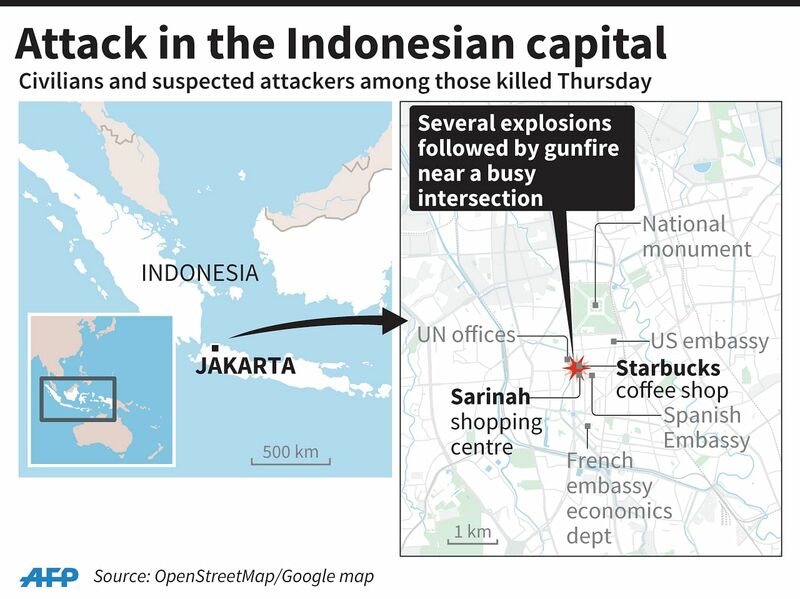 Several blasts were reported in Jakarta on Thursday morning, including outside Starbucks cafe on the ground floor of the Jakarta Theatre building. Two people - a Canadian and an Indonesian - were killed, and 19 others were injured. There have been no reports of Singaporeans hurt in the Jakarta blasts, said the Singapore authorities. Five attackers, including two suicide bombers, were killed. Singapore has stepped up security measures in the wake of the Jakarta blasts, said Deputy Prime Minister Teo Chee Hean. Singapore and Indonesia have agreed to enhance cooperation for the security of both countries, Mr Teo, who is also Coordinating Minister for National Security, wrote in a Facebook post. "In Singapore, we are watching the developments with concern and have stepped up security measures. All of us can also help by staying vigilant. Let us stand together, united against possible security threats," he wrote. He added: "Called my Indon counterpart Coordinating Minister for Political, Legal and Security Affairs Luhut Pandjaitan this pm to convey condolences to the families and loved ones of those who passed away in the Jakarta bomb blasts. "As close neighbours and friends, we are saddened by the loss of lives and injuries. We also agreed to enhance cooperation for the security of our two countries." The Singapore Armed Forces said in a Facebook post that due to the heightened security measures, soldiers on duty "will conduct additional checks for any irregularities and respond to any suspicious activities in accordance with the existing procedures". President Tony Tan Keng Yam said Singapore condemned the heinous act and stands together with Indonesia. "Our thoughts are with the people of Indonesia in this difficult time," he said on his Facebook post. The Ministry of Home Affairs in a press statement said Singapore's security and intelligence agencies have enhanced their checks and are in touch with their Indonesian counterparts on their investigations into the attacks. "But everyone in the community must play their part by being vigilant and to immediately report any suspicious behaviour or persons to the authorities. It is everyone’s responsibility to keep Singapore safe from any form of attack," the statement said. "If an attack happens here, we must respond decisively as one community. Remain united so that any attempt to cause fear and distrust in the community will not succeed. We must be able to recover quickly and emerge stronger as one people,” the MHA statement said. Home Affairs Minister K. Shanmugam added in a Facebook post: "Two months since Paris, and two days after Istanbul, now there is an attack in Jakarta. This menace is just going to grow." Foreign Minister Vivian Balakrishnan said Singapore is monitoring the situation in Indonesia with great concern. Dr Balakrishnan urged Singaporeans in Jakarta to register with the Ministry of Foreign Affairs (MFA). "Our embassy is contact tracing all Singaporeans on our register. We do not have any reports of Singaporean casualties so far. Singaporeans can also contact our Embassy at +62811863348 or MFA 24-hr Duty Office at 63798800/55." Dr Balakrishnan has just returned on Wednesday (Jan 13) from a two-day visit to the Indonesian capital where he met Indonesian President Joko Widodo. Defence Minister Ng Eng Hen said: "Our security agencies will continue to be vigilant, but all of us have a part to keep each other safe and united in these troubled times." Minister for Communications and Information Yaacob Ibrahim also posted on Facebook. He wrote: "Praying for the safety of those in Jakarta." Mr Masagos Zukifli, Minister for the Environment and Water Resources, said that "Such acts of atrocity are cowardly and are to be fully condemned". He added: "We grieve with our Indonesian friends over this senseless attack and the loss of lives." Mr Tan Chuan-Jin, Minister for Social and Family Development, recalled the anxiety in Jakarta when the 2009 bombings occurred, and said: "Our thoughts and prayers are with all in Jakarta. May they remain safe." Minister in the Prime Minister’s Office Chan Chun Sing said: "The news of bomb blasts in Jakarta this afternoon is a grim reminder of the terrorist threat and the need for eternal vigilance." In a statement, the MFA condemned the attacks. “MFA is deeply shocked to learn of the multiple explosions in Jakarta targeted at innocent civilians. We condemn these attacks and express our condolences to the families of the victims. We support the Indonesian Government in its efforts to bring those responsible to justice." The Singapore Embassy in Jakarta is contacting the registered Singaporeans in the city to ascertain their safety, said MFA. It is also in close contact with the Indonesian authorities. Singapore Airlines (SIA) and Tigerair have announced that they will waive re-booking fees for Jakarta-bound passengers. Passengers holding confirmed tickets on flights to or from the Indonesian capital and who want to change their travel plans can get re-book their tickets with no additional fee, SIA has said. Tigerair made a similar announcement, saying passengers could avail themselves of the waiver on travel to and from Jakarta up to Jan 20.